This script does not finish dwarf cannon. The quest is a requirement to smith cannonballs. Restocking: Restocks steel bars from the GE when ran out. 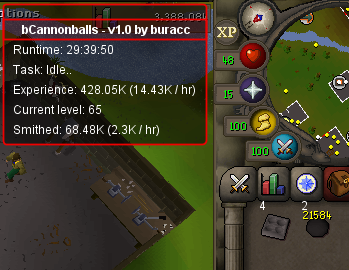 Selling: Sells cannonballs when out of steel bars and buys more steel bars after selling. Easy setup: Give it gold and it will do everything. All feedback is appreciated and taken into consideration. Nice script, are you planning on adding dwarf cannon? Really solid script burak! running for 20 hrs now. Any chance you can add the falador furnace? @Wink Yeah, can do but why? so 500 tokens gets you 6 instances? @burak Really excellent man, ran about 2, 4 hours sessions so far. Thanks! hi, what are the quick start args? any chance it gets 29-35 smith l0l? It well be sick if you can add the quest. burak, whats it all about with muling? Whats the idea? Ppl have 10 bots and put the gold in safe place on a non-botting account ? ?